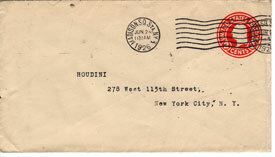 Envelope found in Houdini's desk- touched by Houdini himself! And what a great gift! 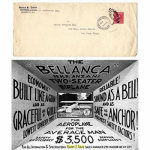 It is postmarked June 24, 1926 from Madison Square Station, NY. Four months later, Houdini would be dead. Even though we can't tell you who sent this letter to Houdini, it must have been someone important, because Houdini saved it! 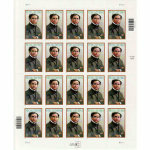 This is a standard size envelope (about 3.5" x 6.25"). It's old, it's been through the mail, it's yellowed.